In this phase the knowledge developed so far is used for designing and implementing the set of procedures and software tools capable of managing the data required for providing informed and robust decision in the following phase. This is necessary to manage and communicate the information flow between various process phases, including exchange, transformation, integration, validation, judgement/valuation, and documentation of gathered knowledge. The exploration of the most likely effects of alternative courses of actions (i.e. the solutions to the given problem) requires capabilities in terms of simulation models, producing outputs which may be used as indicators of the expected performances of the options. With multi-dimensional problems such as those characterising decisions in the social-environmental field, performances will be assessed according to multiple criteria preliminarily defined since the initial step of problem framing. Indicators are used to provide quantitative assessment of each criterion. Both qualitative analyses based on expert judgement and quantitative ones carried out with mathematical models can be adopted to estimate the expected perfomences of the proposed options. Qualitative analyses can also be a preliminary step, followed by quantitative assessment. The shared model of the problem developed during the previous steps is here brought to operational implementation, thus producing an assessment of the expected performances of the options. With multiple options and multiple criteria/indicators to be considered, the outcomes of this phase are typically formatted in an Analysis Matrix (AM), in which one dimension is given by the set of Response Options considered (e.g. different climate change adaptation strategies or measures) and the other is defined by the Evaluation Criteria and/or indicators (i.e. social, economic, and environmental indicators). 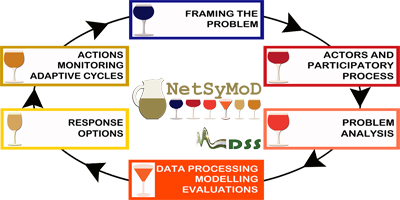 DSS tools here provide the support of ICT for facilitating the management of – quantitative and qualitative – data, models and other elaboration procedures within a common communication and evaluation interface. The DSS tool mDSS typically accompanies the NetSyMoD process.